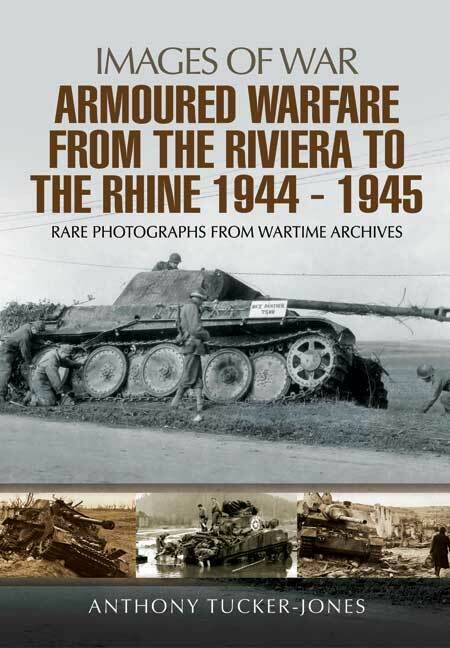 You'll be £14.99 closer to your next £10.00 credit when you purchase Armoured Warfare from the Riviera to the Rhine 1944 - 1945. What's this? While the Allied armies were deadlocked with the Germans in Normandy after D-Day and even as they broke out and began their long advance, another campaign was being fought against the Germans in southern France – and it is this campaign, which is often neglected in accounts of the liberation of Europe, that is the subject of Anthony Tucker-Jones’s latest photographic history. In a sequence of over 150 wartime photographs he tells the story, from the amphibious invasion of the French Riviera – Operation Dragoon – to the battle at Montelimar, the forcing of the Belfort gap, the destruction of German resistance in the Colmar pocket and the entry of Allied forces into southern Germany. His concise narrative gives a graphic overview of each phase of the operations, and the selection of photographs shows the American, French and German forces in action. The mechanized and armoured units and their equipment are a particular feature of the book. The photographs are a valuable visual record of the tanks, guns, jeeps and trucks – the most up-to-date military vehicles and weaponry of the time – as they moved along the roads and through the towns and countryside of southern France. Tucker-Jones demonstrates that the so-called Champagne Campaign was not the cakewalk some historians might have you believe. The invasion of Southern France in August 1944 is a subject which has all too often been overlooked by history, despite its considerable size, and indeed controversy. This book is a photographic history of that campaign, consisting of large, detailed and rare images which follow the American and French forces from the beaches to their arrival on the banks of the Rhine in 1945, highlighting the Battle of Montélimar, the Belfort Gap and the Colmar Pocket. Each chapter is accompanied by a concise history of that stage in the campaign, and as is typical of the Images of War series, the photographs cover a broad range of subjects, above all focusing on the Army element, but attention is also given to the Allied air forces and navies, as well as the French Resistance who played a very active role. The wide array of both Allied and German equipment is clearly displayed and described, and includes anything from tanks and artillery, to amphibious craft and supply trucks. There are a lot of photos to interest the modeller in here, with plenty of detail to be seen, and ideas for dioramas and detail that you might use in a model. One particular idea would be to try and recreate one of the collection points for captured enemy equipment. One particular photo that caught my eye was a captured Jagpanzer IV/70A, which from the shell holes in the side of the front plate looks to be the example that is now on display in the Musee des Blindes at Saumur. I can't imagine two of these relatively rare vehicles having the same pattern of shell penetrations in the same place. All in all another good value for money photo reference in the Images of War series, and an interesting look at one invasion of Europe in WW2 that gets much less attention n the history books than that which took place in Normandy that same year. Absolutely adored this book. As a modeler I find the photos a valuable resource for my modeling work. The Images of War series is a wonderful addition to the library of any WWII Modeler, Gamer or Historian. I am an avid follower of the German side of the war and this book is loaded with great imagery as well ans being very well written by Author Anthony Tucker-Jones.